That’s right, Denny’s. 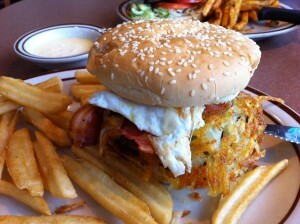 In an effort to try as many burger varieties as possible it was time to try a Denny’s burger. I’ll admit I was skeptical going in but after looking at the menu and talking to the energetic Denny’s server it was decided that the new Denny’s Bacon SlamBurger was today’s burger of choice. To think of anything except breakfast while at Denny’s was interesting but the menu made their burgers look amazing but I was still worried…until the mighty SlamBurger arrived. What’s a Denny’s Bacon SlamBurger? It’s a hand-pressed beef patty with hashbrowns, bacon, egg (cooked to your liking as is customary at all Denny’s locations) and a cheesy sauce between a sesame seed bun. I’ve been known to recommend eggs on any burger and regularly tell people that an egg makes any burger better but to add hashbrowns, bacon and egg did not only look good on the menu it was impressive on the plate in front of me. 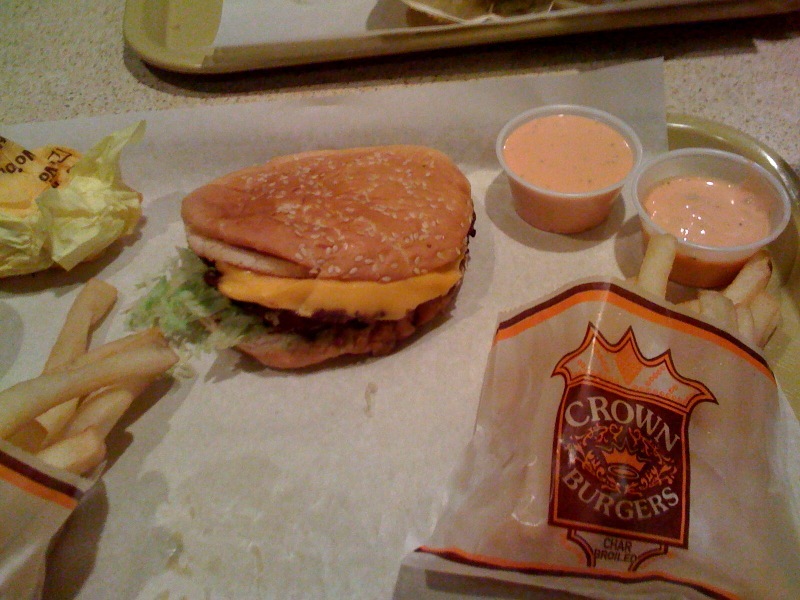 The burger took at most 10 minutes to be served and although the fries were nothing special this was a delicious burger. Everything tasted fresh and the hashbrowns made for a nice contrast with the egg and beef patty. 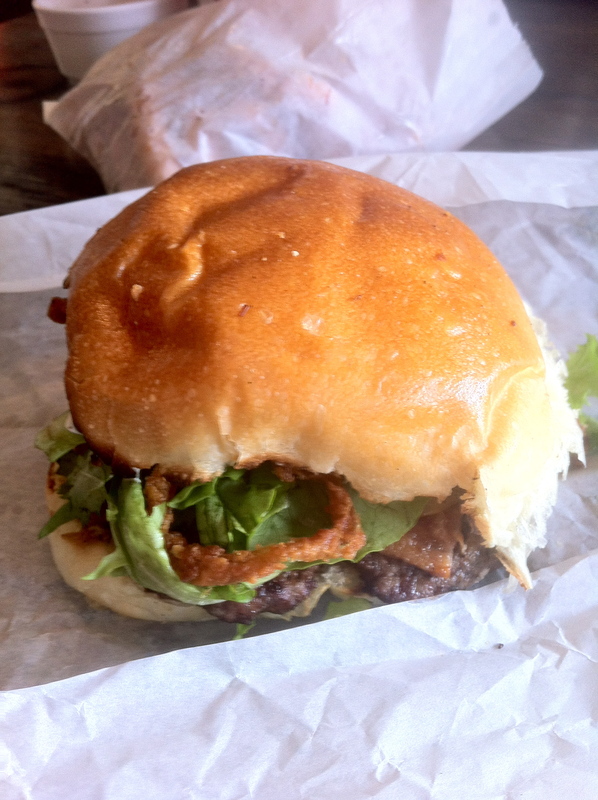 The bun was a traditional mass-market bun and didn’t add anything to the burger but overall it was a very pleasant and nice surprise of a burger adventure. In talking to my burger eating partner we weren’t sure if it was a lack of expectations that made the burger so good or if it was really a good burger but with that said, I’m about to recommend Denny’s Bacon SlamBurger for anyone looking for a burger with flavor, egg and a rather unique combination of toppings. Maybe try a side other than fries because they weren’t that great but I’ll probably be getting the SlamBurger next time I’m at Denny’s…whenever that is. To wrap things up, the Denny’s Bacon SlamBurger was surprisingly tasty, great looking, unique and relatively inexpensive at about $6. om nom nom! i want one. HA! 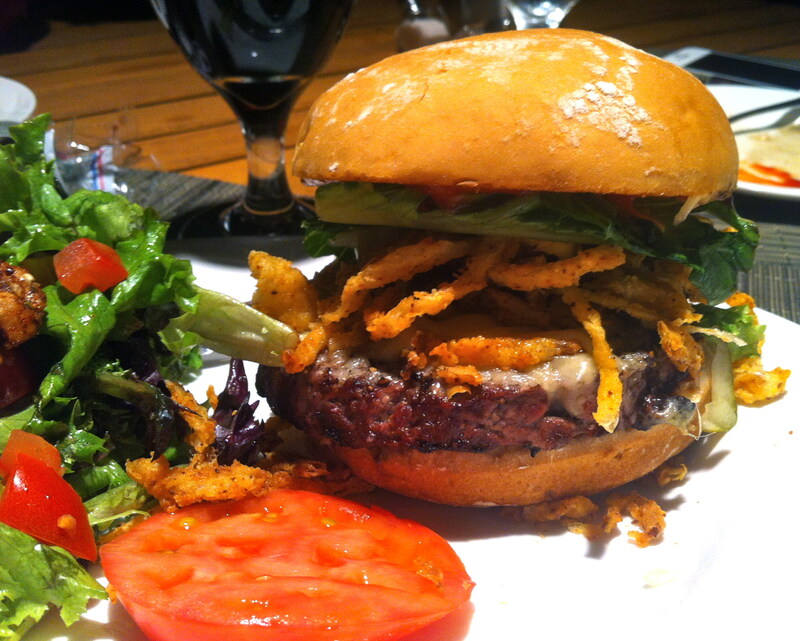 Great review… had a very similar experience with this burger a couple of weeks ago. Denny’s seems to be on a mission to make a sandwich version of it’s breakfast dishes… and this was not too bad. 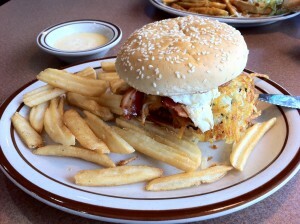 For me, the hash browns made the sandwich, but the flavor of the meat was not as good as I hoped it would be. But the toppings made up for it! 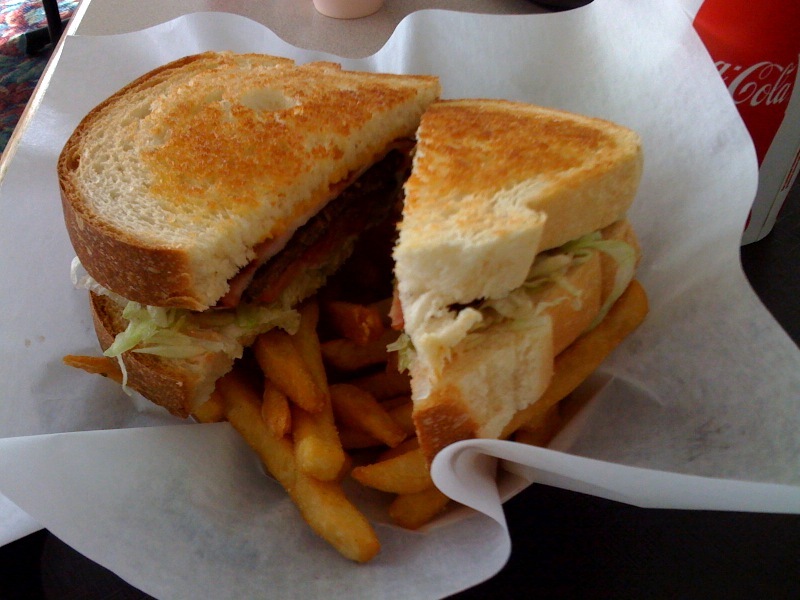 This I may try again or the other breakfast sammich… the grand slamwich. PS… really dig your blog! 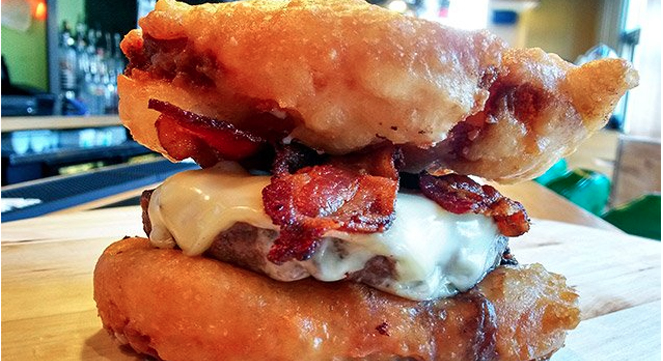 I ordered this burger after seeing it on the menu, and I couldn’t stop smiling afterward. Then, I couldn’t stop giggling. My wife thought I lost my mind, when I really just found perfection in a bun. After a long night of drinking on the Atlantic City beach in NJ, we found a Dennys and were not disappointed. I was shocked because I was actually impressed. Maybe my expectations were low also. Maybe it was the beer. 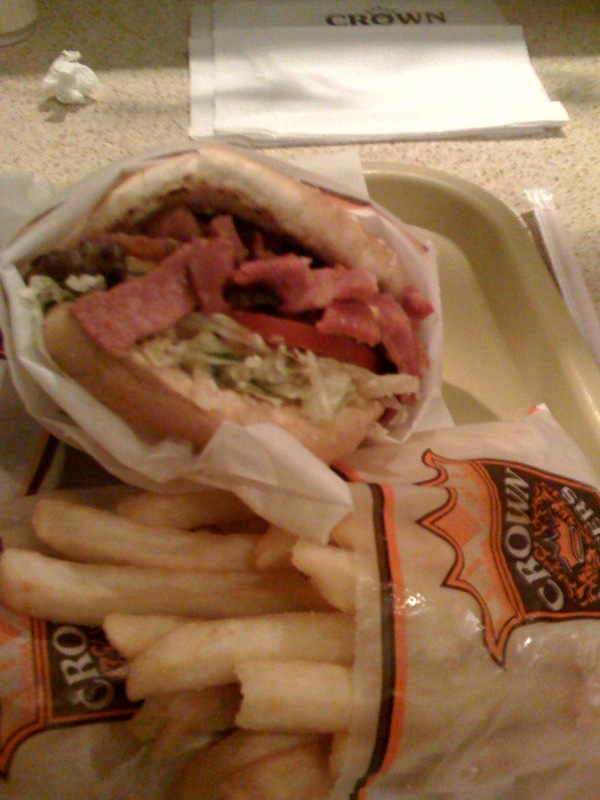 I wanted a burger because that was the usual goto at 3AM. 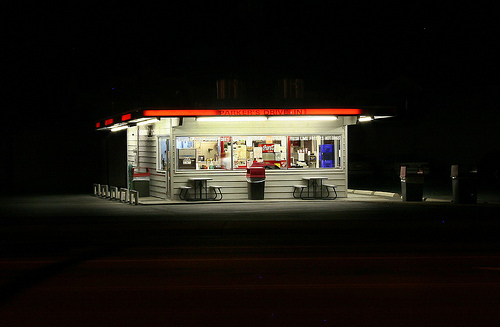 No patty melt on the menu… Regular burgers @ 7.99, I wanted something thrilling. For 70 cents more was the Bacon Slamburger. I ordered the burger medium well and the egg sunny side up/easy/kinda runny. In ten minutes the food arrived. It looked good. Nice, thin, meaty strips of bacon crossed on top of the cheese sauce (kinda like mornay sauce)on top of a grilled, sesame seeded, mass produced bun. The burger sat on the hash browns that were a tad under done (not raw but soft not fully browned). The egg was just a little under with a touch of white still runny. I ordered the seasoned fries for an extra 49 cents and a Nestea Raspberry to wash it down. 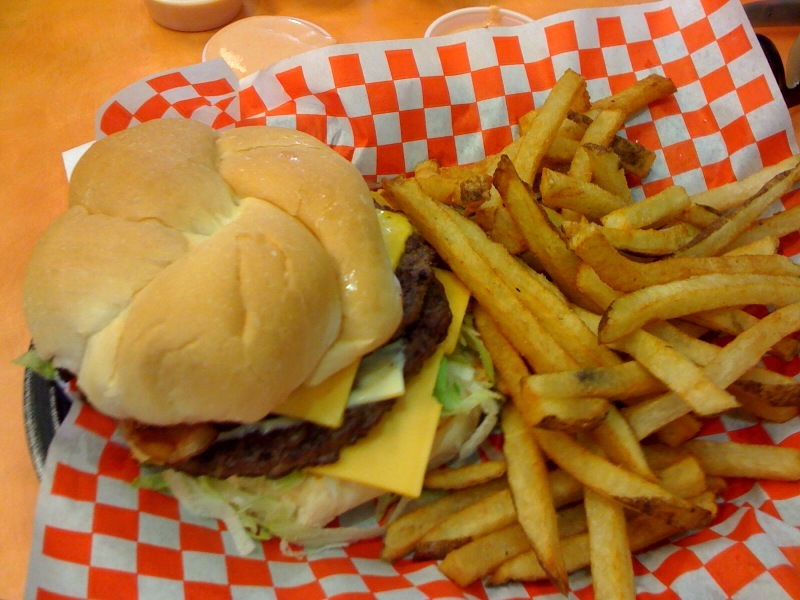 The fact that the burger is hand formed allows the juices and fat to distribute throughout the burger in every bite. It kind of crumbles in your mouth compared to preformed hockey pucks. 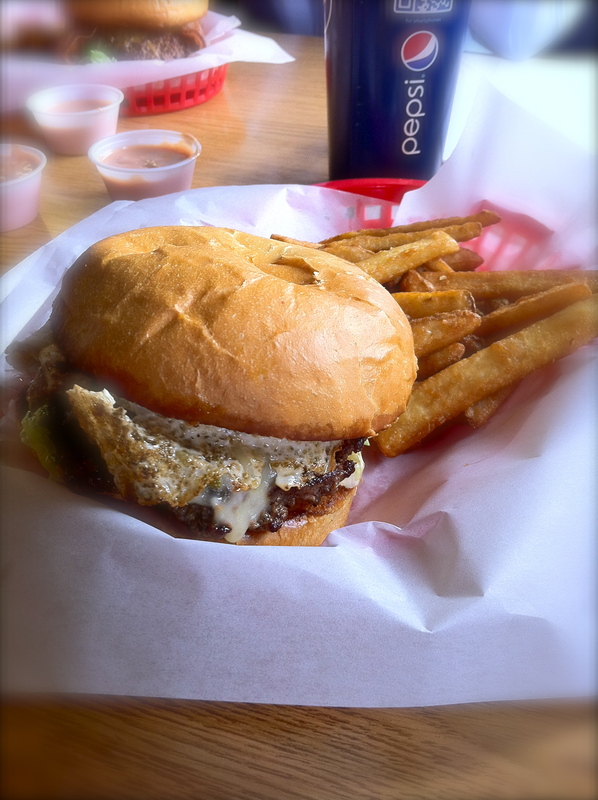 I popped the egg and let the yolk run all over my burger. I also broke the bacon in half and laid them on top. This burger was over the top. It was sooo good. It oozed out and onto the plate. I used the fries to mop up the egg, cheese, and burger juice. I ended up cutting the burger in half to make it easier to eat. 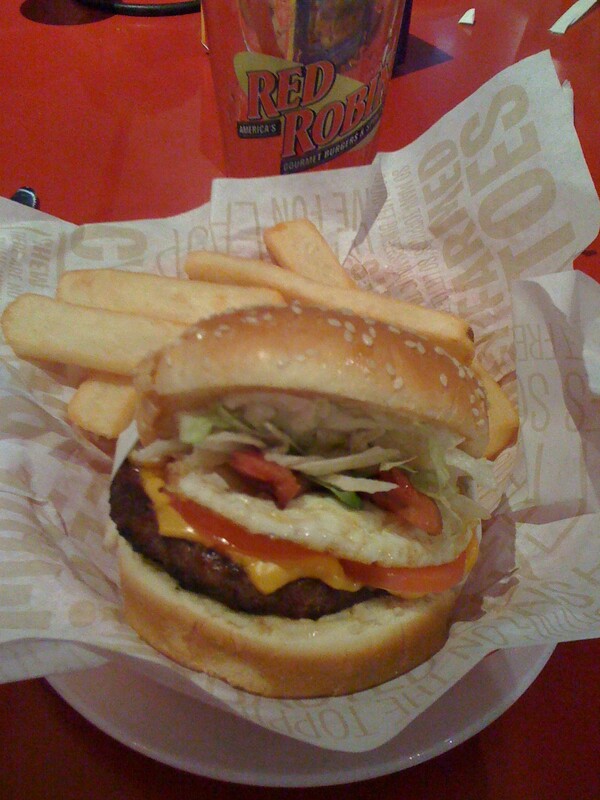 Oh.my.God… I ate the whole thing… 1010 calories worth of burger not counting the fries and raspberry tea. Can’t eat this on a weekly basis but definitely a late night treat after partying. 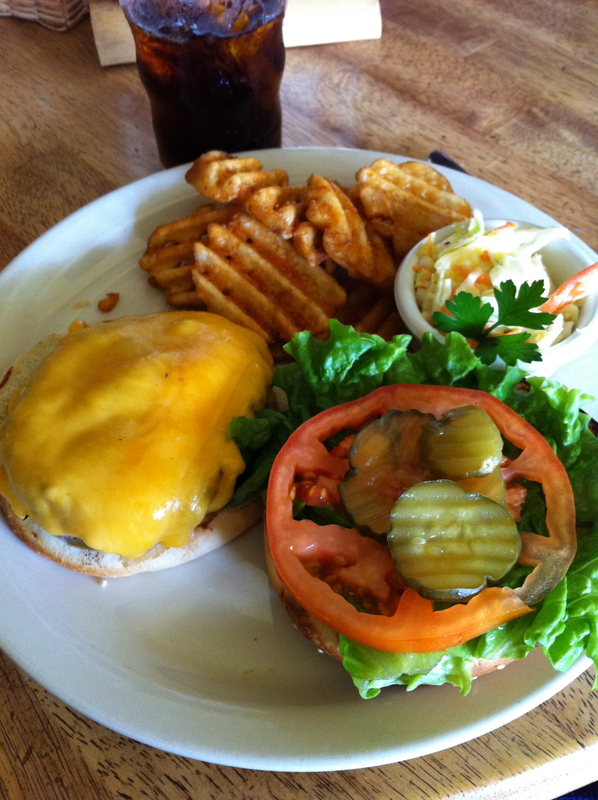 my husband loves this burger it is his favorite… I started making it at home for him… its just delicious..
OMG! Delicious! 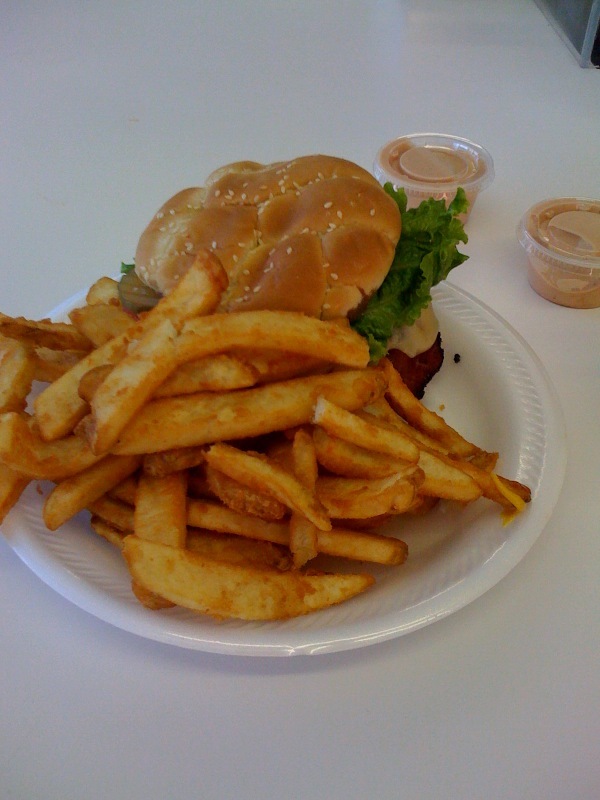 I loved this burger! I’m a true fan and will definitely be going back for me! I had it yesterday for the first time! I didn’t feel 1000 calories. I want another one today. 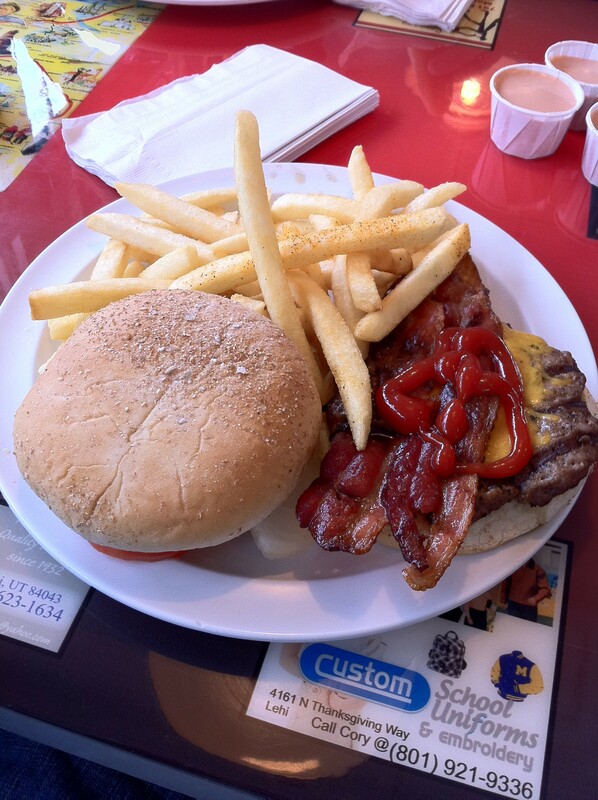 GREAT burger.